Pawtucket got on the board quickly, taking a 1-0 lead in the first on a Dan Butler sacrifice fly. After Buffalo tied the game in the top of the fourth, Bryce Brentz's RBI single in the bottom half of the inning put the PawSox back on top, 2-1. The Bisons would tie the game in the sixth, but Garin Cecchini's first home run of the year gave Pawtucket a 3-2 advantage. The game got away from the PawSox in the eighth, as Buffalo scored five runs to put the game away. Every PawSox starter with the exception of Corey Brown collected a hit, despite the team striking out 12 times. After being rained out for three straight days, Portland returned to action by taking the first game of a doubleheader against the New Britain Rock Cats (MIN), 6-4. Keith Couch picked up the victory, tossing five innings, allowing four runs on eight hits while punching out five. Noe Ramirez picked up his first save of the season, hurling two shutout innings of relief. The Sea Dogs offense was lead by Travis Shaw, who went 4 for 4 with a home run, four RBI and two runs scored. Carlos Rivero added a two run home run to round out Portland's offensive output. In game two, Miguel Pena's solid start propelled Portland to a 6-0 victory. Pena twirled 4 2/3 shutout innings, allowing just two hits and a walk while striking out 11. Michael Olmsted picked up the victory for his 1 1/3 innings of relief. Every Portland started except for Sean Coyle collected at least one hit, with Blake Swihart leading the way with a 2 for 4 evening, including a home run, three RBI and a run scored. New Britain only mustered three hits in game two as they struck out 16 times against Sea Dogs pitching. Salem played well on both sides of the ball as they easily downed the Winston-Salem Dash (CHW), 8-2. 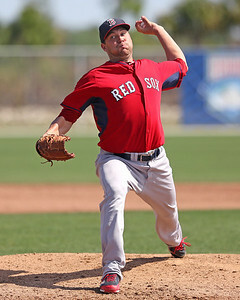 Brian Johnson (pictured, above) tossed six perfect innings, striking out five to pick up his second victory of the season. Carson Blair's RBI double in the first gave the Red Sox a quick 2-0 advantage. In the third, RBI singles by Reed Gragnani and Mario Martinez extended Salem's lead to 5-0. In the fourth, an error, a bases loaded walk to Ryan Dent and a Gragnani RBI single helped the Red Sox put the game out of reach, 8-0. The Dash would score a run in the eighth and the ninth, but only collected four hits in the game. Greenville's contest against the Savannah Sand Gnats (NYM) was postponed due to rain. The game will be made up as part of a doubleheader on May 15th. Player of the Night: Brian Johnson, who tossed six perfect innings in Salem's 8-2 victory over the Winston-Salem Dash. Johnson did not allow a base runner, striking out five batters to pick up his second victory of the season. Spending the majority of 2013 with Greenville, Johnson went 2-6 with a 2.54 ERA in 19 starts between the Greenville, Salem and the GCL Sox. The 23-year-old left-hander is 2-1 with a 5.03 ERA in four starts this season, having an impressive 25:6 K:BB ratio.